This very modern looking gold brooch dates to the 1870s. Its geometric form is comprised of cylindrical elements and tiny rivet-like bosses (round knobs, studs, or other protuberances). The symmetrical structure features a central shaft with two sets of ten small cylinders bundled around the center. Encircling these is a large beaded band at the center. Conical terminals are situated at each end of the central shaft with small beaded bands just inside. Together these elements give the impression of turbine parts or industrial machines, suggesting that mechanical designs and developments of the Second Industrial Revolution (about 1870 to 1914) filtered down to the world of jewelry design and through that, to the individual consumer. The first Industrial Revolution, which occurred between 1760 and 1840, was a period of transformation evidenced by the evolution of new manufacturing processes, and the accompanying changes in production methods, especially as related to iron production, chemical manufacturing, and most importantly the increasing use of steam power, the development of machine tools and the rise of the factory system. The Second Industrial Revolution, followed this after an interval of about thirty years. This iteration was a period of rapid progress, primarily in Britain, Germany and the United States. Building on earlier mechanization, the Second Industrial Revolution greatly increased the use of steam power, focused on the development of the railroad systems, increased mass production of goods and greater large-scale production of iron and steel, as well as wide-spread use of manufacturing machinery, and the beginning of electrification. 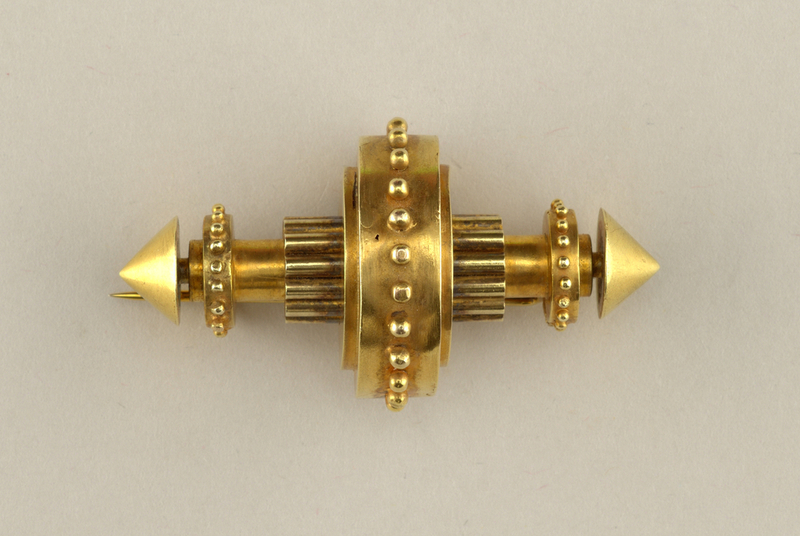 Looking at this brooch it is easy to envision the pistons and drive shafts of early engines. The aesthetic of these Victorian age innovations remains pertinent in the 21st century, particularly to Steampunk culture, a subgenre of science fiction or fantasy that incorporates modern technology that is re-interpreted as 19th-century industrial steam-powered machinery. Steampunk is often set in an alternative interpretation of the 19th-century’s British Victorian era or the American “Wild West,” in a future which has maintained mainstream usage of steam power. Recognizable within the Steampunk world are inventions as people in the 19th century would have envisioned them. This aesthetic also influences fashion, culture, and art. Steampunk fashion has no set guidelines but tends to blend modern styles with garments from the Victorian era. An accessory like this brooch would be equally at home on the bodice of a 19th-century Victorian lady or that of a 21st-century Steampunk devotee. The machine-inspired aesthetic appealed to a Victorian woman who sought out the new or modern. In keeping with the allure of the mechanical, the brooch has transcended time and is relevant to the modern woman involved in the altered universe of Steampunk.